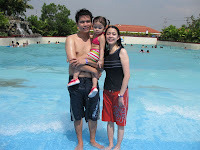 We want to kick start the summer vacation mood and also to test if Reese will enjoy the pool. So without too much planning and research throught the web, we packed our things last Friday night and went to Club Manila East the next morning. It took 45 minutes drive from Manila to the resort. We arrived there before 9 am and a lot of people were there already. Being the family representative, I waited for half an hour in line to the cashier. What caused the long wait was the manual process and some people kept on changing their minds before actually paying fees. Entrace fee per head was based on the accomodation (cottage, tent, room) that the guest would avail. In our case, I chose the cheapest option, the Picnic (tent) type which cost 310 pesos per head for 3 adults. Good thing Reese had no entrance fee yet since she’s less than 3 ft tall. Inside the resort, the Picnic (tent) was just in front of the Beach Waves pool thus it made easier for us to take turns swimming and looking after our belongings. The place was huge and has various pools for different ages. The resort also has kayaks and floaters that can be used for free. We spent most of our time in the Beach Waves pool since Reese enjoyed it more than the other pools they have. 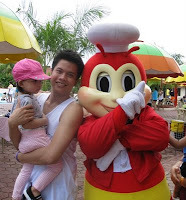 Outside food was not allowed but it was not a problem at all since the resort has a variety of food chains inside like Jollibee, Chowking and Shakey’s among others. I think it was a good idea not to be bothered with bringing food for swimming get-together to focus more on relaxing and bonding with the family. 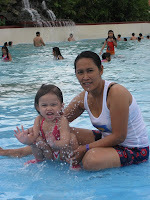 It was the first time for Reese to dip into the pool and she enjoyed it very much especially the wave pool. And based from this experience, it will be best to go to the resort much earlier to enjoy cleaner water just like in any other resort. Also, it was my first time to experience the traffic in that area and it took 75 minutes drive going back to our place. Traffic remains inevitable! can we go there by public transpo? do we need to reserve first before going? yes, you can go there without reservation. but i don't have an idea how to get there by public transpo. i think you can take bus bound to Taytay. the resort is a bit far from the main entrance. i cant remember seeing a tricycle in there.